Posted on February 26, 2014	by chainsoff. Intelligence officials now view the threat from counterintelligence, foreign spying and the leaking, as the No. 2 danger facing the country. 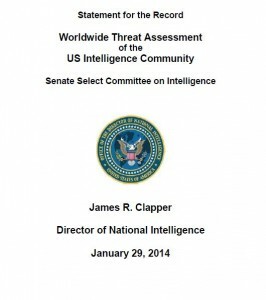 Top U.S. Intelligence officials released a new Worldwide Threat Assessment Report during a Senate hearing last week, they highlighted the top risks to national security. Let’s give a look to the list, cybersecurity is still perceived as a need for Homeland security, it is the greatest threat for a second year, the effects of cyber campaigns conducted by foreign state-sponsored hackers are significant and represent a serious threat. The report also refers to the risks related to the diffusion of documents leaked from the US Government, the reference to the Snowden case is clear, the impact related to the diffusion of secret documents are devastating. It is interesting to note that cyber threats from foreign spying activities and from whistleblowing have surpassed terrorism as threats. Director of National Intelligence James Clapper remarked that documents leaked by Snowden are a serious threat to the USA, cyber terrorists and foreign hackers could benefit from their disclosure. According to Rep. Mike Rogers (R-Mich.), chair of the House Intelligence Committee, the losses caused by intellectual property theft amounted to $2 trillion. “the largest transfer of wealth illegally in the world’s history” and has cost the U.S. an estimated $2 trillion. “We are in a cyber war today,” “Most Americans don’t know it. They go about their lives happily. But we are in a cyber war today.” reported Rogers in July. US Intelligence agencies have tracked back numerous attacks from Chinese IPs, ofcourse, this is not considerable a proof of Chinese state-sponsored attacks, butsecurity experts have no doubts, the Chinese Government is responsible for the majority of attacks against US infrastructures. Lest year Mandiant security issued a report that produced the evidence for the link between Chinese state sponsored hacking and cyber attacks against US private companies and Government Offices. Intelligence officials now view the threat from counterintelligence as the second danger facing the Homeland Security … we cannot blame them.